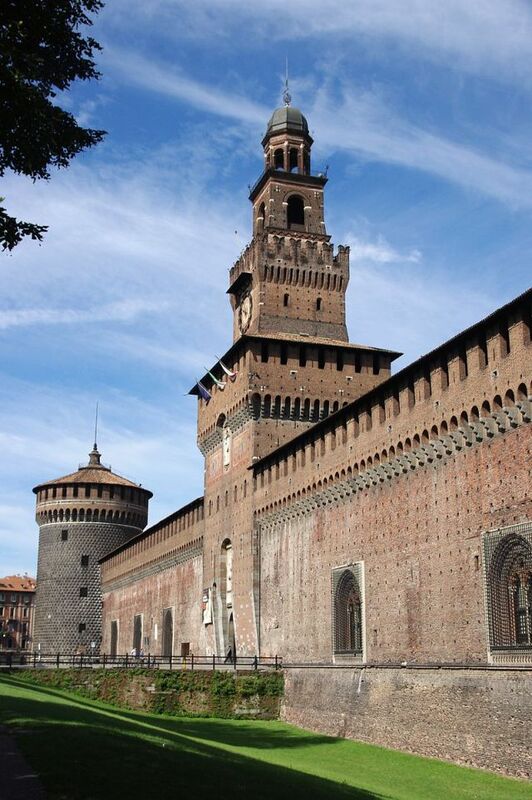 Notes: Sforza Castle (Italian: Castello Sforzesco) is a castle in Milan, northern Italy. It was built in the 15th century by Francesco Sforza, Duke of Milan, on the remains of a 14th-century fortification. Later renovated and enlarged, in the 16th and 17th centuries it was one of the largest citadels in Europe. Extensively rebuilt by Luca Beltrami in 1891–1905, it now houses several of the city's museums and art collections.The castle has a quadrangular plan, site across the city's walls. The wall which once faced the countryside north to Milan has square towers and has an ogival gate. This was once accessed through a drawbridge. The northern tower is known as Torre della Corte, while the western one is called ''Torre del Tesoro: both received wide windows during the Sforza age. The corner defended by the Torre Ducale is characterized by a loggia bridge, attributed to Bramante, and commissioned by Ludovico Sforza in the late 15th century to connect the Corte Ducale (the court in the area used as ducal residence) and the Cortile della Ghirlanda. This ghirlanda refers to a wall, protected by a ditch filled by water, built under Francesco Sforza, of which few traces remain today, including the Porta del Soccorso. Remains of two later ravelins can be seen in correspondence of the point in which the castle was joined by the city walls (near the Porta Comasina gate) and the Porta del Carmine. The Porta della Ghirlanda gate was entered through a ravelin (now lost) and had two entrances accessed through runways, on which lead to an underground passage which continued along the walls. The external side which once faced the walled city has two round towers, commissioned by Francesco Sforza to replace the former square ones, which had become less suitable to defend against fire weapons. The central tower, called Torre del Filarete, is a modern reconstruction. The round towers lost the upper parts under the Austrians, which needed open space for their artillery. Their upper sector existing today is also a modern restoration. The Torre del Filarete and the Porta del Santo Spirito, located more southwards, are both preceded by a ravelin. The main gate leads to a large court from which several internal features can be seen. These include the Tower of Bonza of Savoy (1476) and the Rocchetta, a sort of internal defensive ridotto with a gate of its own. At the right of the Porta del Carmine are remains of two 15th century courts. The Rocchetta, whose access gate from the main court (a modern addition) features the coat of arms of the Sforza, has an internal courts with, on three sides, a portico with 15th century arcades. The Corte Ducale is the wing of the castle originally used as ducal residence; it features a court with two loggias, a smaller one at left and a larger one at its end, called Loggiato dell'Elefante due to the presence of a fresco of an elephant.